When you go out this Memorial Day weekend getting items for you BBQ make sure you pick up some Budweiser. Just in time for Memorial Day, Budweiser is revealing its goal of raising $1 Million for Folds of Honor –a non-profit organization that helps raise funds and provide educational scholarships to families of fallen and disabled soldiers – via America packaging sold this week. 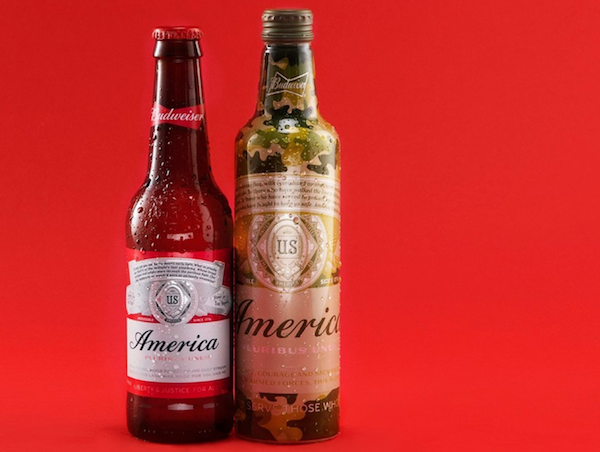 Budweiser is extending its lineup of patriotic packaging this summer to feature America bottles and cans along with the introduction of new military-inspired Camouflage aluminums, both dedicated to the men and women of our Armed Forces. Since 2011, Budweiser has donated a total of $11 million to Folds of Honor and this summer Budweiser is hoping to increase that figure by another $1 million. For every Budweiser America bottle and can sold this week in the lead-up to Memorial Day (May 22-29), a portion of the proceeds, up to $1 million, will benefit the non-profit organization. Print article This entry was posted by Art Eddy III on May 23, 2017 at 11:27 am, and is filed under Lifestyle. Follow any responses to this post through RSS 2.0. Both comments and pings are currently closed.